Another weekend, and time again for watching another new-to-me Hitchcock movie: DIAL M FOR MURDER. DIAL M FOR MURDER was adapted by Frederick Knott from his own play. It concerns a former tennis pro, Tony (Ray Milland), who has realized his wife Margot (Grace Kelly) loves another man (Robert Cummings). Tony has become accustomed to the comfortable life his wife's money provides, so rather than divorce her, he arranges for her murder so that he'll inherit her money. Tony's grand murder plans go awry when Margot manages to stab the hired killer with a pair of scissors, and he quickly improvises a new game plan. I love this movie's cast, but I think one reason I've not made it a point (oops, unintentional movie pun there) to see the movie previously is I have been reluctant to see Ray Milland, one of my favorite actors, play a murderer. Ray is tops as a devious man who is extremely clever...but not quite as clever as Chief Inspector Hubbard (John Williams). It's interesting watching the "wheels turn" as Tony plots to stay one step ahead of the detective; it's one of those curious stories where the viewer almost -- but not quite -- roots for the villain. There are a couple odd things about the way the plot unfolds; for instance, halfway through this 104-minute film there is an Intermission card. I haven't yet found out if there was actually an intermission -- it's not a very long movie -- or if it was simply a theatrical device maintaining the structure of the play. The other thing that caught me off guard was the way the movie suddenly jumped forward in time several months; the rapid developments at that point are a bit jarring. Otherwise, it's a very interesting film with a good script. Grace Kelly is fine as the distraught young wife, although she unexpectedly disappears for much of the movie's second half. (I didn't see the plot twists for her character coming at all...) She looks especially glamorous early in the film, in a dazzling red dress which also makes one aware of the excellence of Robert Burks' color cinematography. I've now seen all of Kelly's movies except two of her other 1954 titles, THE BRIDGES AT TOKO-RI and THE COUNTRY GIRL, for which she won the Oscar. Robert Cummings, who worked with Hitchcock in 1942's SABOTEUR, also does a good job as the "other man," who turns detective himself in the second half of the film. For the most part, though, Kelly and Cummings are supporting characters in the battle of wits between Milland and Williams. Williams, who is superb as the inspector, reteamed with Kelly and Hitchcock the following year in TO CATCH A THIEF. Incidentally, this film was a reunion for Cummings and Milland, who had costarred 15 years previously in the Sonja Henie movie EVERYTHING HAPPENS AT NIGHT. I have to take another look at the DVD tomorrow, as IMDb says Martin Milner was a (British) policeman outside Tony and Margot's flat! DIAL M FOR MURDER is set in London, which is seen only via back projections outside the apartment. Two other items of note: the movie was originally filmed in 3-D. The excellent musical score is by Dimitri Tiomkin. 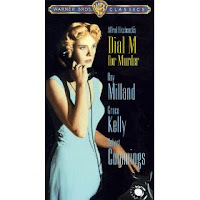 DIAL M FOR MURDER is available on DVD. Extras include featurettes on the making of the film and on the 3D process. The DVD can be bought on its own or as part of the Alfred Hitchcock Signature Collection or the upcoming TCM Murder Mysteries Collection, which will be released on September 1st. The DVD was reviewed by Glenn Erickson, who considers it "probably the best adapted stage play ever done." Hmmm, I'd have to think about that one -- is he including musicals? -- but I think it's safe to say he likes the movie! This movie has also had a VHS release. Previous reviews of Hitchcock films: THE 39 STEPS (1935), MR. AND MRS. SMITH (1941), SABOTEUR (1942), SHADOW OF A DOUBT (1943), I CONFESS (1953), and MARNIE (1964). April 2013 Update: I had the pleasure of seeing this film in 3D at the TCM Classic Film Festival, with longtime Hitchcock associate Norman Lloyd in attendance. Hi Laura! 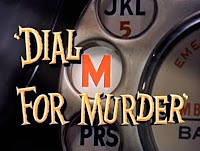 The reason there is an "intermission card" right in the middle of the film is because "Dial M For Murder" was originally released in 3-D (in 1954). Now, in order to properly project a polarized 3-D film the theater had to use TWO projectors....one for the left "eye" and one for the right "eye". Now most (if not all) theaters only HAD two projectors, and a standard reel of 35mm film will last around 40-45 minutes running at 24 frames-per-second. So, after the first "reels" were done, the projectionist HAD to stop the film to thread up the next two reels. He couldn't just jump from one projection machine to the other (which is standard operating procedure even today) because BOTH projectors were being used at the same time. So Warner Brothers used an "intermission card" for ALL of their 3-D releases ("House of Wax", "Hondo", "The Charge At Feather River", "Phantom of The Rue Morgue" and "Dial M For Murder. ")as the reels were being changed. These intermission cards haven't been seen since the film's original release and I'm glad that they are back for the restored DVD's of Warner's 3-D films. They're really classy. The other studios (Universal, Columbia, UA) just stopped the films right in the middle of the thing leaving the audience wondering: "What HAPPENED?" Some patrons would get up and leave thinking the film was over! Thanks for the additional information, Brad. When I saw Hondo in 3-D last September, it was shown without an intermission. I saw MGM's KISS ME KATE in 3-D on a couple occasions in the '70s-'80s and that didn't have an intermission as well, so the possibility of the break being 3-D related hadn't occurred to me. Makes sense. The card was definitely classy-looking, if mystifying! P.S. The DIAL M 3_D featurette confirms that its intermission was for the convenience of theaters with only two projectors. Saw this in 3-D at the London National Film Theatre a while back, along with Vincent Price in House of Wax and a few other favourites. I was amazed at the dramatic effectiveness and (in Hitchcock's hands at least) subtlety of effect achievable by what I had always thought of as a silly fifties gimmick. Eye-opening indeed. I envy you seeing it in 3-D, Matthew. Sounds like a great experience. I hope to have the opportunity one day! Thanks for sharing your impressions.